PasoFino Dance is a brand dedicated to teaching you the joys of Latin Dancing. You see, we believe that everyone (even us pros) prefers having someone else teach us the moves. Why? You learn faster! The faster you learn, the more you enjoy this beautiful dance. Our mission is to bring Passion to the people. To bring out the dancer in you and empower you along the journey. Our one of a kind, athlete instructors guide dancers through an inspirational, fun dance experience that’s designed to benefit the mind, body, and soul. Set in a party club ambience to soulful Latin music, our dancers move in unison to the sound of the beat and follow the signature choreography of our instructors. The experience is tribal. It’s primal. It’s fun. Founder Jose Maldonado, a passionate of Latin music and warmth of the dance community, determined on the vision: To create an alternative to group dance courses that felt like work. He developed an inspiring concept that’s as simple as it is joyful — an experience that’s the best part of our dancer’s day, every day, and that has transformed their views to dance class. We realize this is not just a dance class; it is your hang out, your therapy and your cardio workout. Our dancers say it’s changing their lives. With every step, our minds clear and we connect with our true and best selves. Through this shared self-experience, our dancers learn to let go and seize the moment to experience Life in a different light. We laugh, we cry, we grow — and we do it together, as a community. Anyone can be an athlete, a rockstar, a warrior… our dancers come to us from all backgrounds, fitness levels and dance experience. PASOFino is for everyone. We could go on and on, but you won’t believe it unless you’ve experienced it yourself. Our community is calling your name, so come in for a dance… Take your journey. Change your body. Find your Passion. At PASOFino we believe that a happy society is a healthy society. We use dance to free your mind, to be brave and discover a new you. We learn, we share, we dance, we grow, we accomplish our dreams and we break through boundaries. We do it together, as a family. 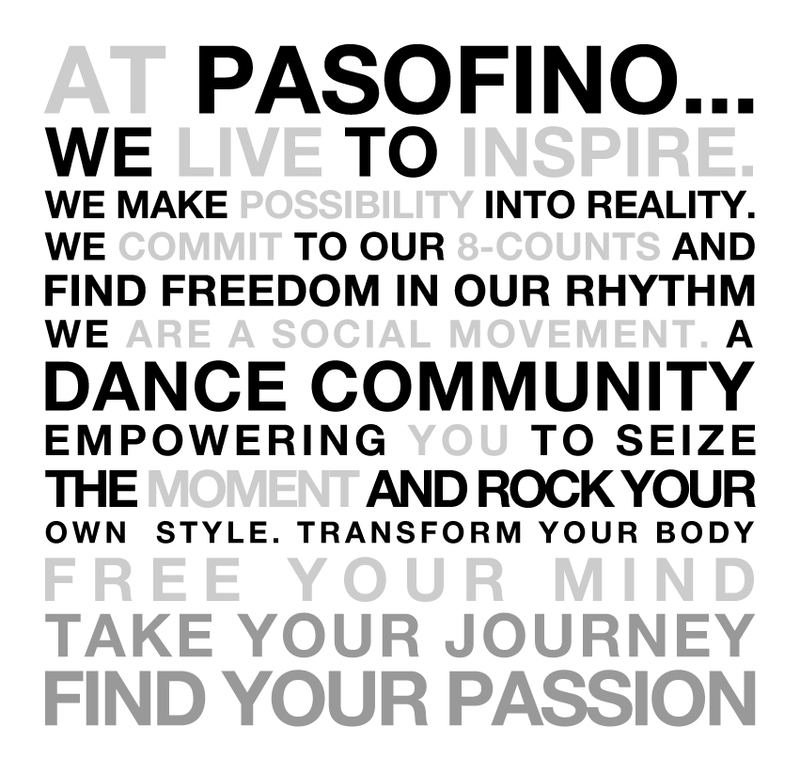 PASOFino is Latin dance studio re-invented. Not only do dancers burn calories and get their hearts pumping, but using the PASOFino® Syllabus, dancers also improve their dance skills while having a blast! Sixty minutes is all it takes to change your mind and body with a complete social experience. At PASOFino we live to inspire. We make possibility into reality. We empower you to find your life’s long passion. With friendly instructors, studio, fun community, exciting events, and spicy music, dancers can let go, seize the moment to experience life in a different light. Need a space for rehearsal, practice, meeting, filming, or photography! Now is your chance to book your time to use this beautiful 1,000 sq. ft. studio or 4,000 sq. ft. ballroom, clean and great staff! Both rooms have independent sound equipment, ballet bars and mirrors with great sprung hardwood floor. For rental rates please contact us. PASOFino Atlanta: Sunday through Thursday – located at 8610 Roswell Rd suite#910, Atlanta, GA in the Sandy Springs area, just 1 mile north of the Northridge Road exit (Exit 6) on GA-400. We are located in the same plaza as the Georgia DMV office.